To celebrate his 36th birthday last weekend, Pablo Iglesias declared war on the Spanish establishment. “Heaven is not taken by consensus,” the de facto leader of Podemos declaimed to a raucous reception in Madrid’s Palacio Vistalegre bullring, “it is taken by assault”. The party’s name translates as ‘we can’, and Iglesias’s keynote speech at their founding conference, a ‘citizens’ assembly’, witnessed the strongest evidence in their nine-month history that ‘we can’ might become ‘we will’. 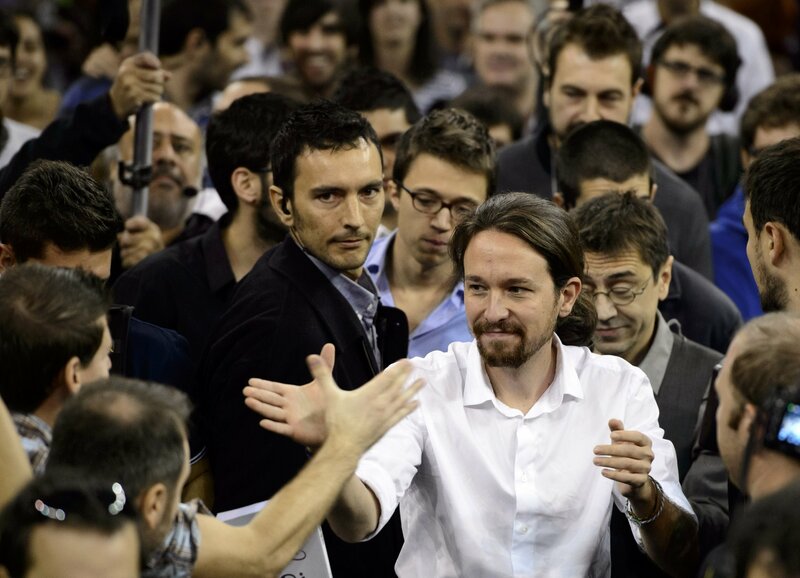 This time next year Spain will hold a general election, and if Podemos continue on their current trajectory, the charismatic but determinedly down-to-earth Iglesias could conceivably be the country’s new prime minister. Wearing a white shirt tucked into jeans, and his trademark ponytail, Iglesias looked more like a postgraduate lecturer than the leader of a potentially revolutionary political force – and until this year he was exactly that, teaching political ­science at Complutense University in Madrid, giving courses called things like “Cinema, political identities and hegemony”, ranging across topics like the Bolivian revolution and latter-day protest movements. So far, the transformation of theory into practice has been remarkably successful. Formed in January this year, Podemos stunned the Spanish political establishment in the European elections four months later, securing 1.2 million votes and 5 seats – and doing so with a campaign budget of only 150,000 Euros. Spain’s two main political parties, the governing PP and opposition PSOE, have held power in one form or another since the death of Franco and establishment of a new democratic constitution in 1978. Combined, the Spanish Socialists’ Workers Party (PSOE) and the People’s Party (PP) got 49% of the vote in May; down from 80.9% at the previous European election. Far from being a mere protest vote, Podemos’s popularity has surged since – they are now regularly polling around 15-19%, a whisker away from the PSOE. Spain’s two-party system appears to be collapsing. “This has been coming for some time,” said Jaime, a middle-aged Podemos supporter from Madrid, showing me a picture of the incumbent Prime Minister Mariano Rajoy emblazoned with the words “España no va bien” ( Spain is not going well), an inversion of the slogan of Rajoy’s predecessor, uttered during what was then described as the Spanish economic miracle. Underneath the picture was an itemised account of the country’s seemingly interminable economic and social malaise: 2 million households without any earned income at all, 5.9 million unemployed people, 700,000 Spanish emigrés “fleeing poverty”, 500 evictions a day. Spanish newspaper El Confidencial reported earlier this month that Spain’s industrial output per capita has now fallen to 1976 levels, the year after Franco died. 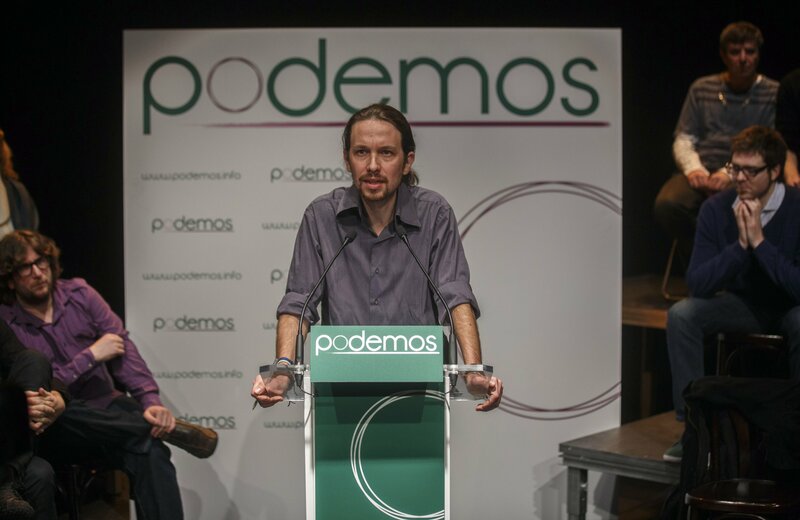 La casta – the establishment – seemed to crop up in almost every speech, debate and conversation during Podemos’s two day citizens’ assembly at the Palacio Vistalegre. With 7,000 people attending from across Spain – and almost as many of them wearing the party’s purple T-shirts – the event captured the paradox that has fuelled Podemos’s rise so far: they are an authentic grassroots movement, powered by activists’ enthusiasm – but they also benefit from the convenient fillip of an articulate, charismatic leader in Iglesias, already well-known for his regular, scathing attacks on Spain’s political classes on television. The rapturous applause that met his entrance to the Palacio Vistalegre was more in keeping with that afforded to the pop stars and matadors who normally take its stage. This month will see further protests and strikes in the Spanish education sector, following more of the same from healthcare workers. Podemos have sometimes tried to avoid using obvious left-wing language, but their supporters, in particular the involvement of a group called Izquierda Anticapitalista (Anti-capitalist Left), and Iglesias’s line about storming heaven – a possible reference to Marx – tell another story. The speed of Podemos’s rise has astonished even its leaders, but the party did not drop out of the clear blue Spanish sky. The citizens’ assemblies of 2011’s summer-long mass protest movement, known as the 15m, or indignados, continued in less spectacular form after the protest camps were closed down, devolving to local neighbourhood chapters. In barrios across Spain, small groups continued to meet on Saturday mornings in town squares, campaigning on local issues, organising to help families facing evictions, or struggling to feed themselves. This grassroots organisation gave Podemos a ready-made, experienced activist base, and the electoral success in May saw many more local circulos (circles) start up, even in the smallest of villages. Some are organised by neighbourhood, others by political or professional theme: there are circulos for feminism, arts and culture, disabilities, public health and so on. Having web-savvy young political scientists at the heart of their political strategy seems to have served Podemos well, so far. The old hands of the PP and PSOE are understandably concerned, and are hoping Podemos’s awkwardly broad coalition of voters and lack of experience sees them exhaust themselves before 2015’s general election. In the meantime, the PP former president of the government of Madrid, Esperanza Aguirre, has spearheaded another line of attack, accusing Podemos of being in cahoots with “Chávismo, Castrismo, and ETA”, while the newspaper El Mundo has made further accusations that Iglesias is linked – albeit tenuously – to groups sympathetic to the Basque terrorist group. It is the references to Venezuela and Cuba that seem to have caught on amongst Podemos’s critics. None of the attacks on the party’s credibility seem to be swaying the party’s energetic, growing base. “I am actually proud we don’t have political experience,” Carmen told me outside the bullring, as chants of “Sí se puede” (yes we can) rang out from inside. “In my life, political experience has always meant corruption and self-interest. Spain needs a completely fresh start.” Carmen, 31, had never voted before the European elections, and she was not alone. Analysis of the 1.2 million who voted for Podemos in May found that 25% had not voted in the last Spanish general election in 2011. Worryingly for the PSOE, 36% of Podemos voters had voted PSOE in 2011. In reference to the accusations of division, Iglesias requested – and received – “an ironic round of applause to the people who say we are divided”. The Iglesias bloc faced down a rival organisational proposal from a slate including several of Iglesias’s fellow MEPs, designed to “ensure diversity and prevent monopolies”, according to MEP Lola Sanchez. The proposal called for three party ­leaders rather than one, and devolved more decision making power to the circulos. For Iglesias, ­commitment to pluralism and decentralisation had limitations. “You don’t defeat Rajoy or [PSOE leader] Pedro Sanchez with three general secretaries,” he told the assembly – “only one”. Otherwise, the commitment to direct democracy at the Palacio Vistalegre was substantial, if somewhat bewildering for the technophobic. Podemos have succeeded so far in part because of the weekly circulos in town squares, but also through online participation on the party’s web forums, on Reddit, and via Facebook – and they recently trialled the use of Appgree, a smartphone application whereby users in the bullring or watching at home could ask questions, make proposals, and vote on each other’s answers. The party’s policy programme for the general election is likewise an attempt to implement open-source, direct democracy: anyone could write a proposal document and upload them to the party website, and the proposals were then lobbied for, discussed, and finally, voted on. Almost 40,000 people voted on the online proposals. Meanwhile, in the absence of corporate funding, even the costs of the citizens’ assembly – €132,711, to be precise – is the subject of a crowd-funding website. For Moruno, mass participation, even when it means disagreement, is the party’s great strength. “When we attack la casta, it is not only the policies of this government, it’s wider than that: it’s a way of thinking about politics. We have a democratic deficit in our culture; we have had it for the past 40 years. Because we have competing ideas here at the assembly, they assume that this means there is great conflict, or division – when actually, it’s democracy. La casta think that ­politics is like a cortijo [a ranch], enclosed and separate from the people – they can’t think of ­politics any other way. Correction: This article originally stated that Esperanza Aguirre was the mayor of Madrid. In fact she was the president of the Community of Madrid, Madrid's government, between 2003 and 2012.